Established in the year 1962, we, Want Want Holdings Ltd., are engaged in manufacturing and supplying good quality baby products like Organic Toddler Mum-Mum, Superslim Brown Rice Crisps, etc. 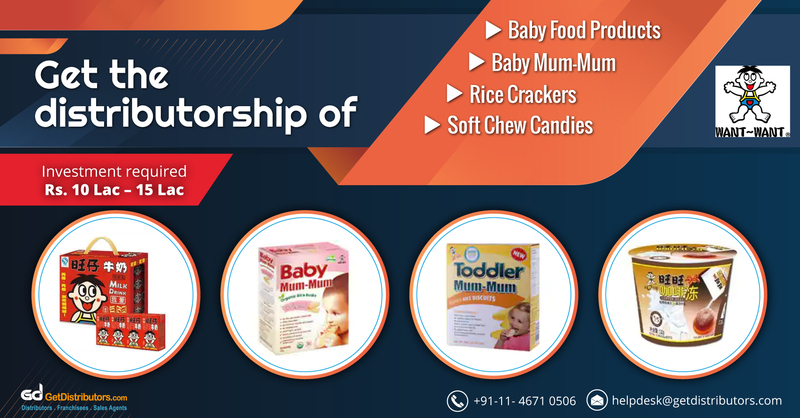 Offered baby food products are made by the use of pure and hygienic ingredients and are loaded with vitamins and minerals, that ensures healthy and strong development of the child. Hence, they are highly recommended by mothers in various countries. All our products are manufactured by professionals and are tested on several parameters to ensure that they are safe for consumption by babies and toddlers. With 56 years of experience, we have a created a market in more than 50 countries and specially in the mainland of China. Our annual sale ranges between Rs. 2000.00 Cr – Rs. 2100.00 Cr. To expand into newer markets, we are looking for trustworthy city level distributors.